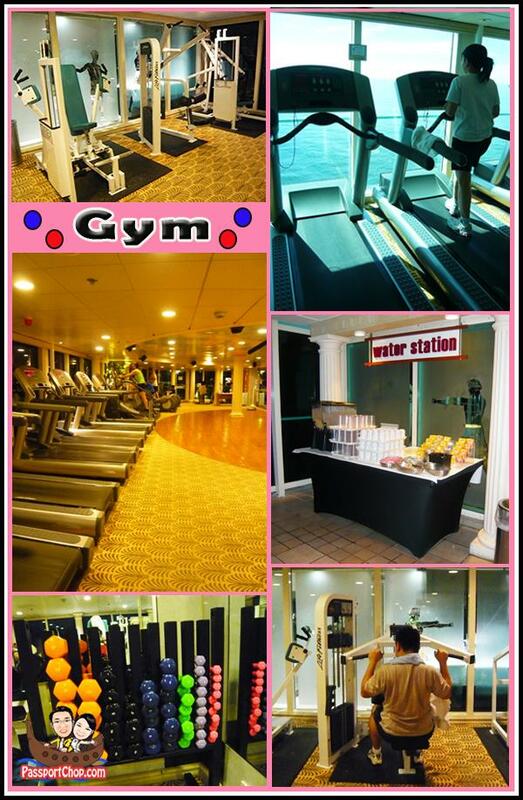 The best way to work out all the calories gained from all the yummy food onboard the Legend of the Seas, is by joining in the range of fun physical activities e.g. 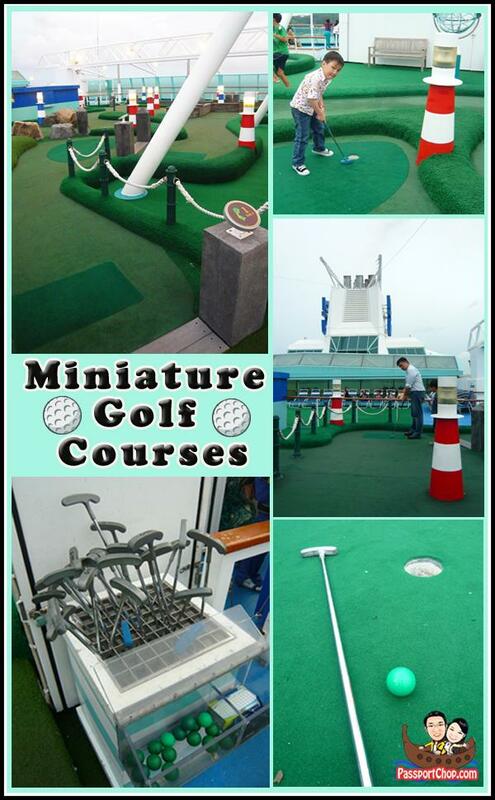 miniature golf, gym and rock climbing. Located on the top deck, you will find a challenging rock climbing wall – it is usually packed with climbers and spectators so come early to beat the queues. There are 3 levels of difficulty (with the centre being the hardest to climb) for this wall. All equipment e.g. 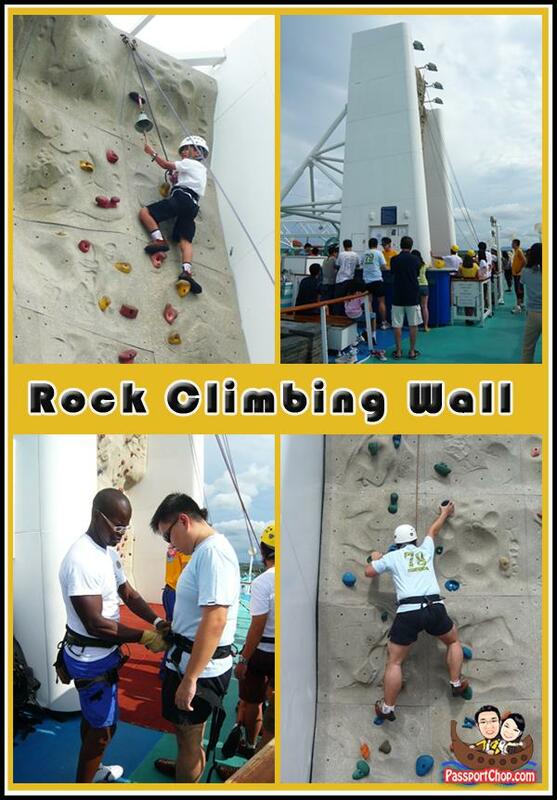 helmet, harnesses are provided and you will be in the safe hands of the experienced Royal Caribbean staff who will belay you as you climb up. Besides training in the gym, you can also consult the onboard personal trainer to develop a healthy living plan tailored to your body’s needs (for a fee). There are also free seminars e.g. Secrets to a Flatter Stomach where you can learn how to achieve permanent weight loss and gain energy and vitality. For a less strenuous and fun way to burn some calories, consider taking up miniature golfing onboard the Legend of the Seas. Besides navigating through the narrow golf courses and obstacles e.g. other golfers, you also have to apply the right amount of strength so as to counter the winds on the deck – quite a challenging course. Not sure if typical golfing techniques work here – just have fun and hit the ball and see where it goes – who knows, you might get a hole in one (albeit in the next hole :-)). I admire everything have done on this article. I love the element where you say you are doing this to give back again but I might assume by every one of the comments that this is working for you as well. This is really great for all the sport minded out there. I will tell this to my dad as he is a sport lover, especially on extreme sports. Thanks for sharing the photos and the post.